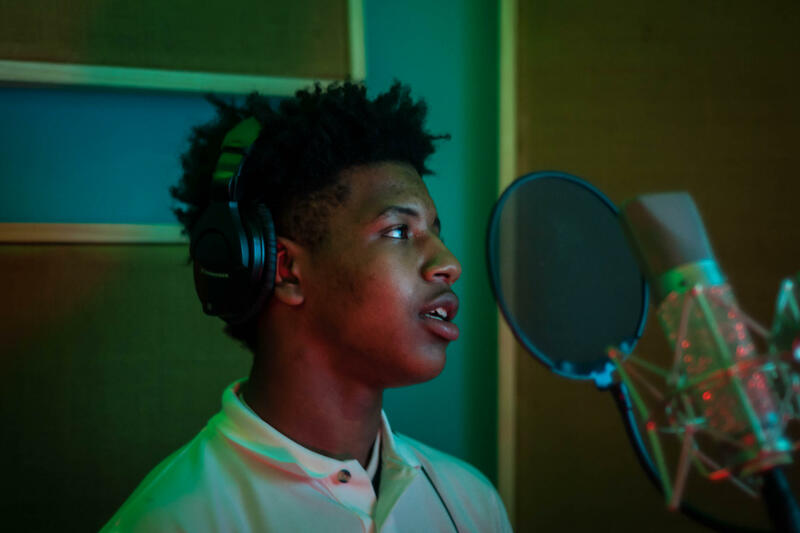 Arthur Ross is a freshman at Innovative Concept Academy and one of the finalists of the Mentors in Motion songwriting competition. Here he records the hook to a new song. Ross is one of four finalists in a songwriting competition sponsored by Mentors in Motion, an organization aimed at developing students through art, science, math, reading and technology. Submissions of original poems, raps and songs came from students throughout the St. Louis Public Schools. The winner will walk away with a $5,000 scholarship to the college of their choice. Students from four St. Louis Public Schools are in the final round of the Mentors in Motion Songwriting Competition. The grand prize includes a $5,000 scholarship to the school of their choice. The four finalists are students at Carnahan High School of the Future, Sumner High School, Innovative Concept Academy, and Metro Academic and Classical High School. The program began when Pitts saw how students from different schools and backgrounds all related to music. 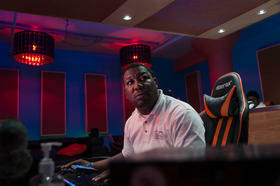 He decided to intertwine the skills he gained as a hip-hop producer with the competition. “They move to rhythm, they move to the music that’s on the radio, if that’s what keeps them focused, then let's educate them through music,” Pitts said. For Ross, a freshman at Innovative Concept Academy, it’s an opportunity to showcase his new outlook. After being suspended from another high school, Ross landed at ICA, in the St. Louis Place neighborhood. The school was created by Judge Jimmie Edwards to educate students suspended from other schools for more than 180 days. Ross is now using the songwriting competition to show his school pride and his changed attitude. “Everybody was telling me that I was a bad child, and I’m not a bad child, I made a mistake that can be fixed,” Ross said. The competition encourages students to submit works that focus on a positive topic. While some of the songs touch on school pride, others delve into the students’ personal lives or the issues affecting their communities. Metro sophomore Ariel Gordon is another of the finalists. She's a member of Metro's poetry club and said she’s always had a passion for music. Gordon also sees music as a way to highlight her interest in social activism. Her song lyrics take inspiration from the late poet/entertainer/activist and St. Louis native Maya Angelou. Gordon explores what the so-called school-to-prison pipeline, an issue she said affected her cousin. “Before he got killed he was suspended from school, pushed out from school and basically set in like a trap of the system, so I think it’s very important to talk about that,” Gordon said. She said she’s considering pursuing a career in law or sociology, and working for the reforms her music discusses. Ross participates in the Mentors in Motion robotics club and has earned awards for some of his robotics submissions. His song lyrics also highlight his career goal. “I wanted to be an engineer from all the way back in third grade,” Ross said, pointing to a robotics program that first sparked his interest. The winner of the competition will be presented with the scholarship at a gala event Friday night at the Thaxton Speakeasy at 1009 Olive St. Missouri state Rep. Bruce Franks, Jr. will serve as the keynote speaker.